Hundreds of sporting figures and fans gathered for the funeral of footballer Phil O'Donnell, who died after a match on Saturday. The 35-year-old Motherwell captain collapsed during a game against Dundee United and was pronounced dead a short time later in Wishaw General Hospital. A post-mortem examination revealed he had died from heart failure. The Requiem Mass took place at St Mary's Church in Hamilton, South Lanarkshire. The service, conducted by Father Henry O'Brien, was for family and friends only but hundreds of fans gathered outside the church to pay their respects. A guard of honour was formed by the Motherwell youth team for the arrival at the church of the player's grieving widow, Eileen, and their four children. More than 500 mourners attended the event. 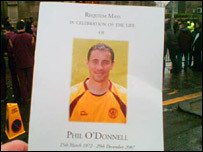 Former team-mate and Motherwell captain Chris McCart was among those to read a tribute to O'Donnell during the service. Recalling how he had first met the player when he turned professional, McCart said: "He was a young, skinny, 16-year-old lad but even then he showed a great maturity and positive attitude in everything he did. "As a person he was approachable, with no airs or graces. He made time for everyone and we all felt very comfortable in his company. He is an example to us all." Derek Moore, 33, a Motherwell fan for 25 years, from Carfin, added: "When Motherwell won the Scottish Cup in 1991 and he scored one of the goals, it was one of the greatest days of my life as a Motherwell fan." A large number of figures from the footballing world arrived at the church, including Celtic captain Stephen McManus, O'Donnell's former assistant manager at Celtic, Murdo MacLeod, and former Motherwell manager Maurice Malpas. Former Celtic team-mates Peter Grant and Pat Bonner were also there, along with Everton striker and former Motherwell player James McFadden. O'Donnell's Motherwell team-mates arrived an hour before the start of the service, led by manager Mark McGhee. Jack McConnell, Scotland's former first minister, and Birmingham City and former Scotland manager Alex McLeish also attended. Outside the church lay wreaths from football supporters and clubs across the UK. O'Donnell's former club Sheffield Wednesday and Scots football legends John Collins and Tommy Burns were represented. 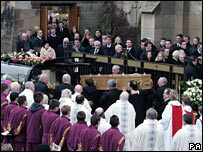 After the Mass, O'Donnell's coffin was carried from the church to the waiting hearse. Several matches were postponed following O'Donnell's death as a mark of respect. His father, Bernard, thanked all the people who had shown support for the family over the last week and at the funeral. "From the moment this terrible tragedy happened, we have been deeply moved by the efforts made to comfort and assist our family," he said in a statement issued after the service. "This has meant a great deal to Eileen and everyone in the family."